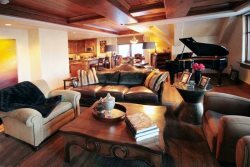 Cozy 1BR Vantage Point Condo in the Heart of Lionshead Village, Walk to Slopes and Nightlife. Cozy 1 bedroom condominium located in the heart of Lionshead Village. Approximately 508 square feet. Easy walk to slopes, restaurants and nightlife. Amenities include kitchenette, fireplace, balcony, common area parking, common area W&D, common area pool and hot tub. Guests staying at this property also have free unlimited access to the Aria Club & Spa. The Aria Club and Spa is located adjacent to the Cascade hotel off of South Frontage Road. The facility boasts over 78,000 square feet and is Vail's most extensive workout facility & spa- unprecedented for its professional approach to fitness and personal wellness. Offering fitness classes, personal training, Pilates, cardio and weight-training equipment, an indoor track, indoor basketball court, indoor tennis courts, racquetball, squash, heated outdoor swimming pool and hot tubs, the Aria Spa & Club takes fitness to the ultimate level. Guests also receive 10% off spa treatments M-Th before 2 P.M.